Audi says that without the plug-in hybrid system the A7 Sportback h-tron Quattro would be underpowered, offering the equivalent of just 136 hp. Audi r&d boss Ulrich Hackenberg provided a concise answer when asked why the carmaker’s fuel cell also needs plug-in hybrid technology. 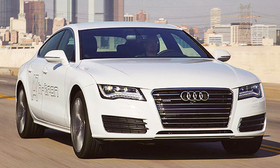 “To make it a proper Audi,” Hackenberg told me last week at the Los Angeles auto show. Without the plug-in hybrid system the A7 Sportback h-tron Quattro would be underpowered, offering the equivalent of just 136 hp, and would disgrace the Quattro name because it wouldn’t have all-wheel drive. A top speed of 180kph (111.8 mph), which is more than enough to get license revoked unless you’re cruising on a German autobhan. While Hackenberg’s technical explanation make sense the car has little real-world potential at the moment because Audi says it won’t market fuel cell vehicles until a hydrogen recharging infrastructure is in place, which will take years. That means the A7 Sportback h-tron Quattro will remain an interesting example of visionary engineering.